Witness captivating nature on this Iceland south coast tour. Allow us to take you on an Iceland south coast tour in this short travel video. You’ll witness enchanting scenery and brilliant natural views of waterfalls, black sand beaches, and even the remnants of a plane crash. If you’re interested in embarking on an Iceland south coast tour, you’ll likely start in Reykjavik after flying into the country. After spending a day in Reykjavik, we ventured out on a two week road trip of Iceland. Even if you don’t have two weeks, you can still easily see the southern coast of Iceland. 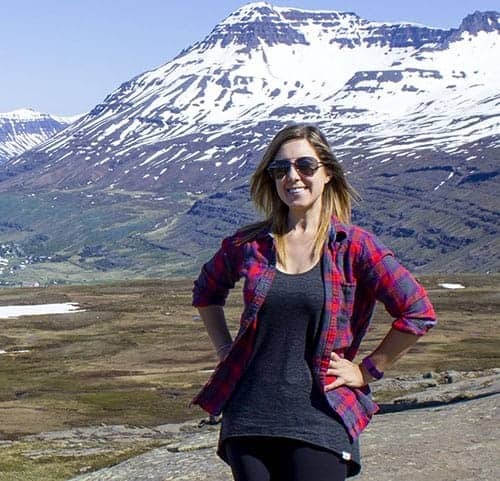 I recommend spending one day in Reykjavik, one day exploring the Golden Circle (check out our video of the Golden Circle), one day venturing out to the south of Iceland, and the last day visiting the Snaefellsness Peninsula in west Iceland. You’ll cover a lot of ground and view some incredible scenery in four days. Naturally, if you’re looking to spend two weeks like we did, I recommend that you read all of our Iceland travel articles for valuable information about our trip. After all, Iceland is one happy nation and happiness must be contagious as we were filled with joy as we drove around the Ring Road. From Reykjavik to the Golden Circle and to the south coast of Iceland, we admired stunning view after stunning view. 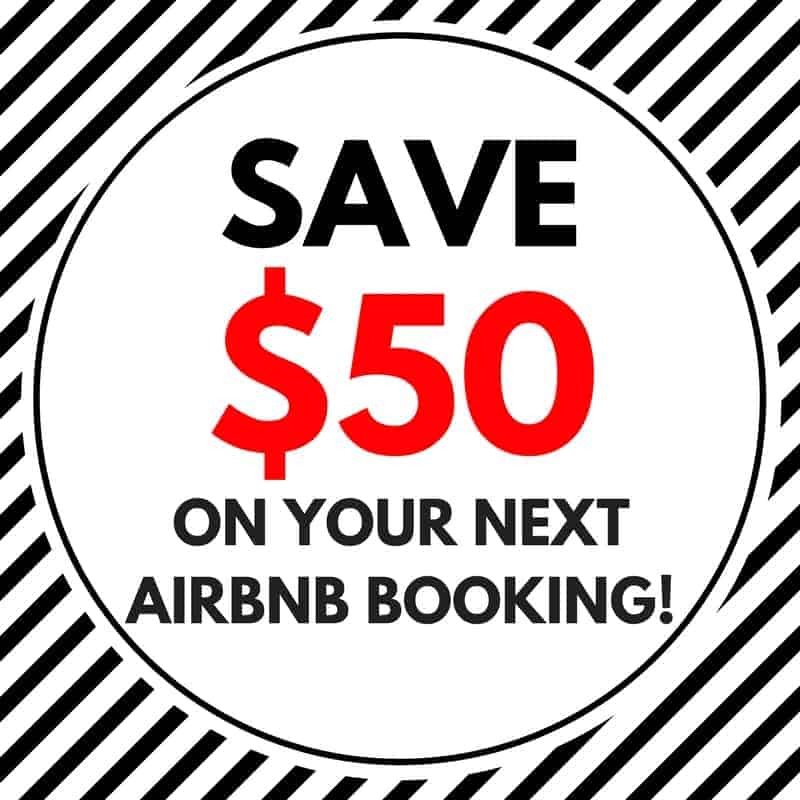 It’s best to rent a car and take a self drive tour to travel around Iceland on your own terms. You can spend as much or as little time at any natural attraction. Furthermore, you can stop anywhere you like along the way. You might find yourself pulling over every five minutes to take more photographs as you’ll see beautiful scenes around every turn. 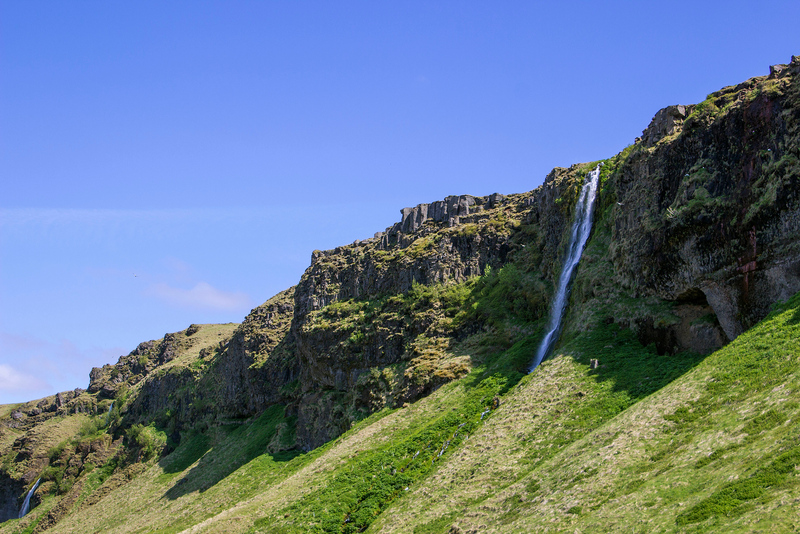 On our Iceland south coast tour, we visited two majestic waterfalls (Seljalandsfoss and Skogafoss), an alluring black sand beach (near Vik), and a few surprises along the way. Seljalandsfoss is a famous waterfall with a 60-metre drop. It’s possible to walk behind the waterfall. Be sure to bring your rain jacket! Gljúfrabúi is a secret waterfall in the same area as Seljalandsfoss. It has a cute name, “the one who lives in the canyon”. You can view this waterfall by walking through a narrow entrance in the Franskanef Cliff. 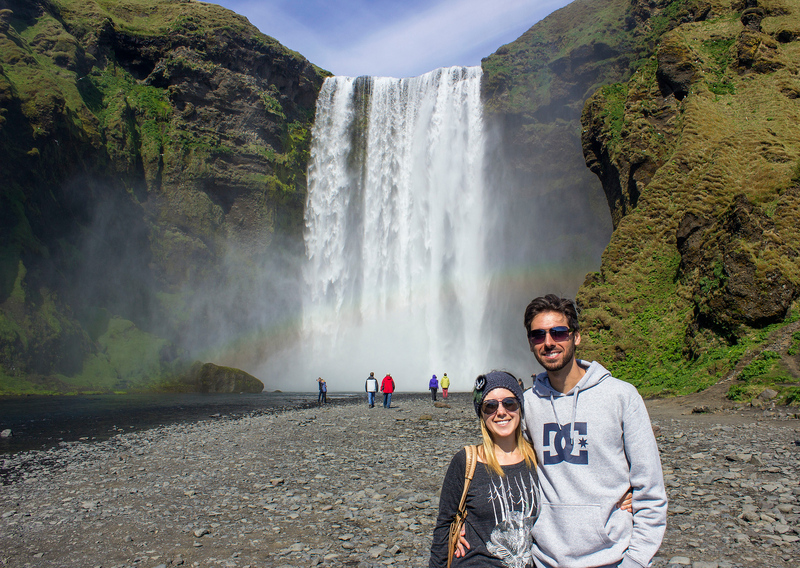 Lastly, Skogafoss is one of the largest waterfalls in Iceland it’s very easy to visit off the Ring Road. From the base of the waterfall, there is a staircase built into the side of the mountain. We hiked up to the top of the waterfall for amazing views of the coastal lowlands and the Icelandic highlands. 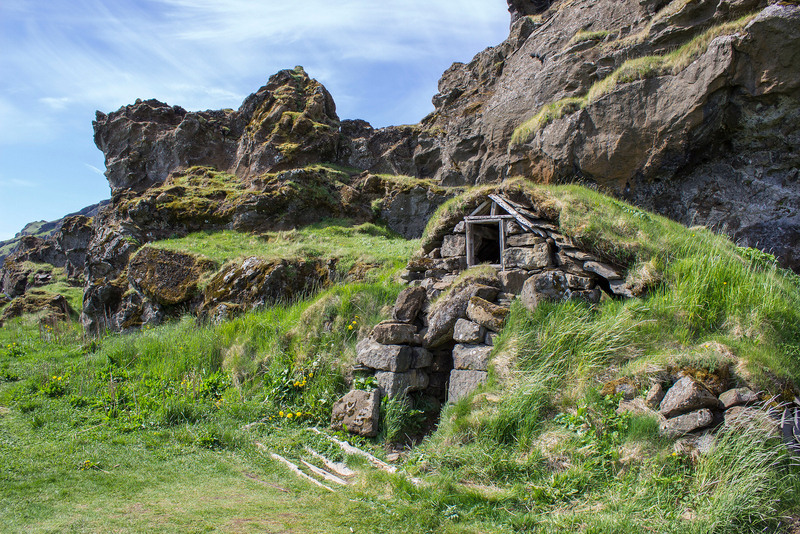 The turf house tradition in Iceland dates back to the settlement days of the 9th century. The turf houses at Drangshlíð are currently being preserved and eventually, restored. There were a few old homes built into the hillside, with grass and turf comprising the roofs. 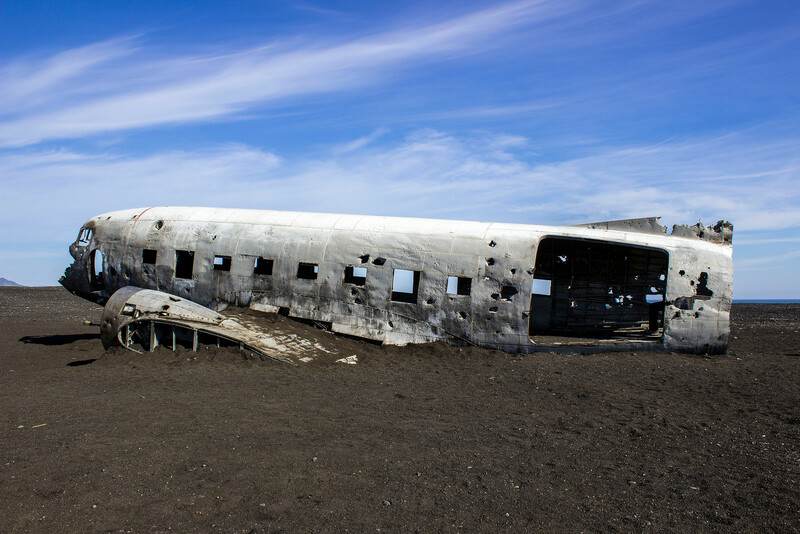 The Sólheimasandur plane crash site is a popular spot in the south of Iceland. In 1973, a United States Navy Douglas Super DC-3 airplane had to make a crash landing due to extreme icing. Fortunately, everyone survived the plane crash. The wreckage remains near the Sólheimasandur black sand beach. There’s a large parking lot off the side of the road. The walk to the plane crash takes about 45 minutes. Witnessing the crumbled wreckage of this small plane is well worth the trek. 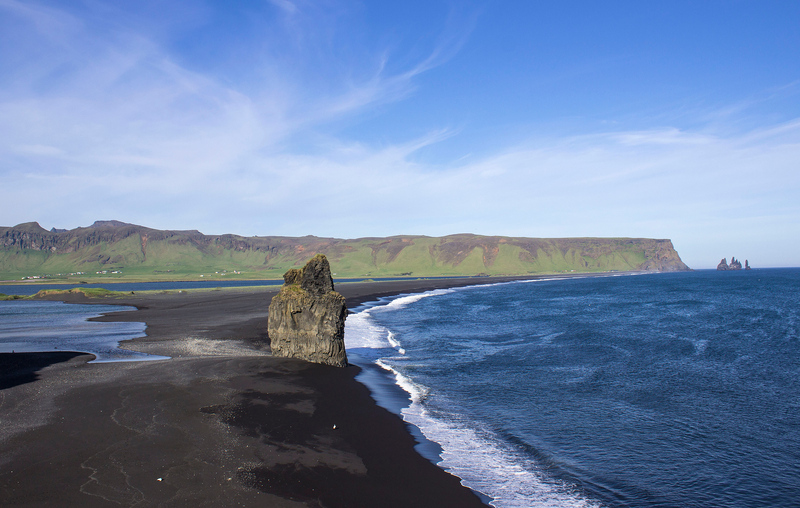 Justin and I explored the dramatic black sand beach of Reynisfjara near the town of Vik, which is a stop you must make on your Iceland south coast tour. We admired the views from the peak before trekking down to the adjacent Kirkjufiara Beach to put our own footprints in the sand. Deep blue waters, tiny black pebbles, and distant rock formations will surely dazzle you. Interested to see more photos from the southern coast of Iceland? Check out our South of Iceland travel photo album. Have you ever traveled to Iceland? Where have you visited? We just continue to see more and more reasons why we need to get to Iceland! You guys have some epic shots, especially the waterfall from your vlog! Amazing video!! I love it! We really enjoyed exploring the south coast, especially all the waterfalls. Iceland is so gorgeous and this makes me want to go back immediately–really love the drone shots! Love the drone footage guys. It really shows off the breathtaking beauty of the landscape and using that waterfall shot near the front was a great idea. I’ve subscribed to your Youtube channel. Which drone do you use? I love the video!! the views from the drone are fantastic. Love the video – you guys got some spectacular footage. Guessing some of that is from a drone? Traveling outside of Reykjavik was the best thing we did on our trip to Iceland – the countryside is so much more than the city has to offer. Looking forward to more of your videos, photos and posts! Iceland is a definitely on our bucket list! Video is such a great way to showcase how amazing a place is! That is great that you are keeping a vlog of your whole trip. Every time I see an Iceland video or photos, I’m kicking myself for not visiting yet. How can that be? Your video is beautiful. what a beautiful place! And good to see it on the video too. I hope to visit Iceland one day and a road trip is definitely the way to go. Whenever I see pictures of Iceland I yearn to go there, and this video has just multiplied that by hundreds! It looks like such a phenomenal place. I can’t wait to visit! Ah… this looks so beautiful. I am kind of jealous. I always take videos of the places I visit, but as I am never able to get material of me (as i am the one filming) the outcome looks rather dullish..besides editing takes soo much time.